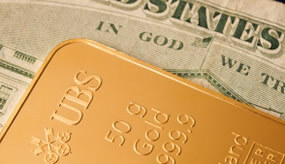 Precious metals futures settled lower Thursday as the U.S. dollar rebounded and stocks rallied. Declines in gold and silver were their first in three days. Gold for December delivery retreated $1.90, or 0.1%, to settle at $1,350 an ounce on the Comex division of the New York Mercantile Exchange. "Gold prices ended the U.S. day session with modest losses in a two-sided and lackluster trading session Thursday," Jim Wyckoff, a senior analyst at Kitco Metals Inc., said in a report. "A rebound in the U.S. dollar index was a bearish outside market force working against the precious metals on this day." Gold futures ranged from a low of $1,345.80 to a high of $1,359.40. Silver for September delivery shed 15 cents, or 0.7%, to settle at $20.02 an ounce. Silver futures traded between $19.90 and $20.34. October platinum dropped $26.40, or 2.2%, to $1,156.70 an ounce, ranging from $1,144.70 to $1,185. Palladium for September delivery tumbled $34.60, or 4.8%, to $691.80 an ounce, one day after notching their highest close since June 2015. The precious metal traded between $690 and $727.85. Gold rose $7.30, or 0.5%, to $1,355 an ounce. Silver fell 12.5 cents, or 0.6%, to $20.21 an ounce. United States Mint bullion sales were unchanged Thursday. Below is a sales breakdown of U.S. Mint bullion products with columns listing the number of bullion coins sold during varying periods of time. Products with an asterisk (*) are no longer available. Once again the real headline should be the very large swing in the PGMs – palladium & platinum! Amazing movement up & down for 2 days now. A bumpy ride for sure! Also, not a single HF 5-oz silver bullion puck sold in two months now. The Mint’s 13 worldwide bullion coin APs are not interested in them obviously for some strange reason. Any guesses why? As a proud RCM platinum plus member and Canadian, I am very selective with the coins I purchase. 5 -oz anything is a tough sell and an even tougher buy. Maybe one per year is a hit. The HF 5-oz silver bullion pucks you made mention of are a poor investment and possession to own. Investing is an art, but the appreciation of art and currency requires a coin of beauty and long term investment. These coins have none of those qualities. I hope your American mint listens to the consumer and starts to produce coins of not only unparalleled quality but innovation.